The wreck at the 1987 Winston 500 at Alabama’s Talladega Speedway was another crash that forced NASCAR to reevaluate its rules and regulations. This time, the problem at hand was speed. Racers knew things were going to be fast after Bill Elliott drove his Thunderbird 212.809 miles per hour during qualifying on April 30. Therefore, when the race took place on May 3, drivers prepared themselves for an all out, wide open affair. It was during the actual race that Bobby Allison (going close to 200 miles per hour) shredded a wheel on his Buick and spun around backwards before flying up and over the retaining wall, his car slamming back down and getting annihilated by several other race cars. 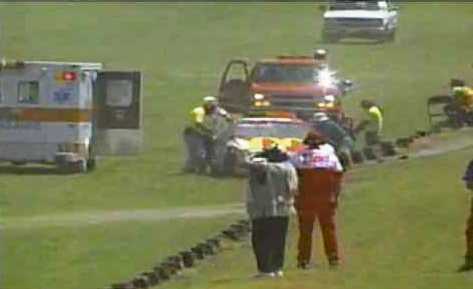 While Allison was uninjured, multiple fans were hit by debris and had to be rushed to the hospital with minor injuries. As a result of this incident, NASCAR required Daytona and Talladega-ready vehicles to install “restrictor plates” beneath beneath the carburetors, which would choke the speed of each vehicle to a less dangerous number.